I love asking my readers for advice when it comes to kitchen appliances. 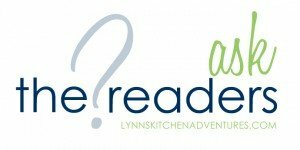 So today I have an Ask the Readers question for you about pressure cookers. I am not talking about the kind of pressure cookers you use for canning fruits and vegetables. I am talking about the kind of pressure cookers you can use to cook meat, beans, and other meals. Growing up my mom used a pressure cooker all the time. She used it for roast, stew, all kinds of meat, potatoes, and many other things. She really did use it all the time. At least several times a week. For some reason though the older types of pressure cookers kind of scare me. I grew up watching my mom use one all the time, and nothing bad ever happened, so I don’t know why I am leery of them, but I am. Because I knew my mom loved pressure cooking, when I heard about electric pressure cookers several years ago, I decided to buy one and give it a try. I bought a Cuisinart model similar to the picture above. I then used it a few times and kind of forgot about it. I liked it, but did not really love it. It cooked fine. I used it for stew, a few roasts, and beans. It all cooked great, but I just did not fall in love with cooking in it like I hoped I would. So now it is taking up valuable cupboard space in my kitchen and I am wondering if it is worth keeping. Because it is an expensive item I want to give it a try again before I get rid of it. This is where you all come in. I need help learning to love my electric pressure cooker . What do you all think? Are they worth it? If you have one, or even use a non electric pressure cooker, I would love to hear why you love it. What do you cook in it? And why do you think they are worth having in the kitchen? My mother pressure cooked a lot when I was growing up, too. I have a non-electric pressure cooker, but had the same experience as you. I pressure cooked a few meals, then mostly forgot about it. It’s simply not my preferred method of cooking. I would much rather put a meal together in the crock pot and let it cook all day. The results are just as delicious, but the process is easier. Some day I’ll finally decide the cabinet space is to precious to waste and sell or donate my pressure cooker, but I doubt I’ll ever use it again. Well I don’t have one yet, it’s on my wish list. I did use my mom’s a few months ago for macroni and cheese. It took 8 minutes and was gooooood. I love my electric pressure cooker. It is one appliance I can’t live without. You can come home and have no idea what to make for dinner. Throw in some frozen meat like chicken, ribs, pork roast. Put some broth, barbeque sauce, onions or whatever and be eating in 45 minutes. It infuses the food with flavor. Cheap cuts of meat can be made very tender. You can also make a big kettle of soup in that time. Then it keeps it warm until you want to serve it. If mine ever breaks, I’m getting another immediately. I need to try ribs in it. I think my family may enjoy those cooked in it. And I have never tried soup either. I need to give that a try. I just got my electric pressure cooker and made soup this weekend one the spur of the moment. So good and hubby was impressed! I love my pressure cookers!! I have used pressure cookers for 40+ years and I wouldn’t be without one! I have owned an electric pressure cooker for about 6 yr. and love it too! One of the best things about it is if I am in a hurry, forget to thaw something out, etc., there is nothing better than my trusty pressure cooker! I love pre-cooking ribs in it when I grill or smoke them!! The reason I like my electric one so much is that is basically no muss, no fuss. You set it and it does it all for you as opposed to the stove top one. You can do so many things with the electric one and control it, not to mention the warming feature most of them have! I don’t use them everyday but when I need it, I have it and wouldn’t want to be without it!!! LOVE my pressure cookers!!! I’m sorry about the typos and bad grammar in my previous post but I was in a big hurry and wanted to share my thoughts with you and didn’t have time to think. I’ve thought about a few more points and wanted to add them. 🙂 I LOVE doing chicken in them also. You can put a large chicken in and in 30 minutes have fresh chicken to use for a multitude of chicken dishes, such as; chicken & dumplings, chicken salad, tons of chicken casseroles, etc. My family loves beans and when I forget to soak them overnight or if they just get a sudden craving I can throw them in and have beans for them in less than and hour and half, as opposed to 24 hours. When you get ‘surprise’ company or are in a hurry, for whatever reason, think ‘pressure cooker’ and you will fall in love with it very quickly!!! Just today I wanted to make split pea soup. I melted butter with the browning feature and threw in some carrots, celery and onion. I cooked for a minute with 1/2 t. of tumeric until they started to get soft. I dissolved some ham bouillon ( i didn’t have any diced ham) in 8 cups of water and put that in the pressure cooker along with 2 diced potatoes and 2 cups of dry yellow split peas (just rinsed). Set on high pressure for 15 minutes and I had soup. I wouldn’t trade my digital pressure cooker. My mom received her Presto pressure cooker as a young bride in 1946 and used it often for our family meals. I wish I could duplicate her stewed beef that she served over rice – so delicious. I have had my stove top Presto stainless cooker for about 10 years and I use it often: brown rice in 12 minutes, fresh southern-style green beans in 3 miinutes, country-style pork ribs with kraut and vegetables in 15 minutes, dried beans in minutes rather than hours, etc. When I had my little mini poodle, I would make his food each week with ground turkey, brown rice, a sweet potato or carrots, green beans, and broth. He was very healthy and lived to age 15. Perhaps the electric cookers are better now after a few years on the market, but when I was on a Yahoo Group for PCs, many people there had trouble with fuses and what-not on the electric models. I love the simplicity of the stove top cookers, ease of cleaning, and double-duty use of the pot as a cook pot w/o the pressure if desired. I know if I need a new gasket or part in the future, Presto will still be around. I bought my 6 qt. stainless PC at http://www.pressurecooker-outlet.com/; I just wish I had bought an 8 qt. model. I’m happy to provide any support and “hand-holding” to help your readers get over their fear of pressure cookers! My mom’s was a presto too! Thanks for sharing your thoughts. My grandmother gave me one for a gift and I absolutely LOVE it. Mine has a delay feature that you can set a timer for it to come on and cook. When I get home from work my supper is all ready and I only have to set the table and get side dishes ready. I’m not sure if all of them are like this but mine has several different settings and can be used even as a slow cooker. If YOU did not fall in love with it, it may just not be the tool for YOU! What we think is probably irrelevant. 🙂 I, myself, prefer pressure cooking to slow cooking, because I’d have to set the slow cooker up in the morning before work when I’m cranky, rushed, and hungry – whereas the pressure cooker cooks when I need it (NOW). 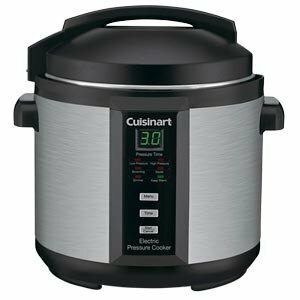 I use it for a couple specific things: brown rice (which we eat often, and the pressure cooker means I can cook it the night I need it and not be having dinner at 8pm), and any kind of stewed meat (chuck roast, pork shoulder, venison, etc.). I’d say give it one more go and if it doesn’t catch, sell it. Get it into the hands of someone who will use it! Thanks. I think you may be right. I love my slow cooker, but pressure cooking may not fit what I need right now. But I have never cooked rice it. I am going to have to try that one! And I have cooked beef roast, but not a pork roast, so I need to try that as well. Thanks for sharing your thoughts. I have both electric and stove top. I love both of mine, the stove top one is a very large on so I use it for chicken broth, beans, soup. I waited a few years for my mom to give it up and give it to me. I also use my electric one to cook rice, and beans that I freeze. I like to cook them a lil on the harder side so I use the electric on for that. I also cook a lot of grains and soups in it. I waited along time to get it. I had been looking for years for one that had the stainless steel bowl on the inside. I had to choose between an high end rice cooker or electric pressure. I have the worlds worst kitchen. No storage or counter space. It looks like a New York Apt. I found that Chef Brad has a lot of recipes that I love for a electric pressure. I have never cooked a roast init yet. But I do love to cook chicken breast in them over my slow cooker for salads and I love whole chickens cooked in them for other dishes. Its my best friend for Artichokes in the summer. I love it, when I am power cooking. I have it going 2 crock pots, a huge slow cooker. I just line them up on my dining room table. I use my stovetop pressure cooker at least once a week for mashed potatoes (cooks in 5 minutes! ), or whole potatoes to make crash potatoes. I also use it to make ribs, soups, chicken broth. It has come in handy to make a last minute roast. Oh yeah, when corn goes on sale I’ll buy a whole bunch and cook them in there (4 minutes!). Like someone else mentioned, it does infuse the flavor into the food. I have 3! I love them. I don’t feel nervous or scared to use it. I also can with it for high acid foods like jam and jelly. Wolfgang Puck has 3 cookbooks for it and I make everything from re-fried beans with dry beans in 45 mins to beef stew yummy….Broth in minutes …worth the time and money for me…. Thanks! I need look for Wolfgang Puck’s cookbooks. I would love to see a couple cookbooks on cooking in pressure cookers. I think that would help me use it more. I’ve had two nice electric pressure cookers and ended up donating them to charity. I’m more of a slow/crock pot kind of cook. I absolutely love my pressure cooker. It cuts cooking time, keeps the kitchen cooler and saves the day when you are so busy you forget about dinner. Dry beans are super fast, you can soak in 5 minutes, then cook in 12. When my husband first bought it for me, I felt like you, but once I found out all the things I could do, it really took off for me. The biggest key to getting into it was finding Miss Vickie’s site. She is the pressure cooker guru. She has instructions, recipes and ideas to pressure cook anything. http://missvickie.com/ Don’t forget desserts! Flan is really easy to make in the pressure cooker. You just need a trivet and foil. Thanks! I will check out that site. I have a Kuhn Rikon stove top pressure cooker. Actually I have two because I use them a lot. I cook white or brown rice in it all the time. I also use it for potatoes, a variety of soups but especially split pea soup, chicken stock, roasts, and sometimes veggies (but they get done really quickly). I’m sure there is more, but those are things I use it for the most. I have an Instant Pot. I use this electric pressure cooker at least twice a week. It is perfect for some staple foods eaten in my house. There is a technique for making the most perfect rice (better than a rice cooker). You can also do foolproof hardboiled eggs that peel like a dream. Large beets cook in 20 minutes. I make a 40 minute spaghetti sauce in mine that tastes like it’s been simmering for hours. 5 pounds of spare ribs are done in 20 minutes. We tend to do all the cooking for the week in one or two sessions, so a slow-cooker is not convenient. The electric pressure cooker can be used for one dish after another. Just rinse out the steel liner and you are good to go. I am new to the electric pressure cooker and love it. I use my slow cooker but found that it was on longer than the recommended 8 hours and my meat dried out . I can now do the same meals in the pressure cooker in under an hour. I have made mac & cheese which my family loves. I’ll threw in some chicken thighs with chicken broth and 10 minutes later it is done and moist, I use it on salads or wraps for my lunches for the week. Just made rice last night for the first time so easy and didn’t have to stand over the stove. Find some great recipes and give it another try I’m sure you’ll love it again!